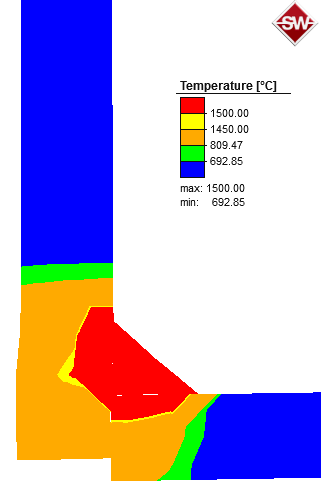 The most prominent possibility for result evaluation is three-dimensional visualization of resulting fields (temperature, stresses, distortions, and so on). 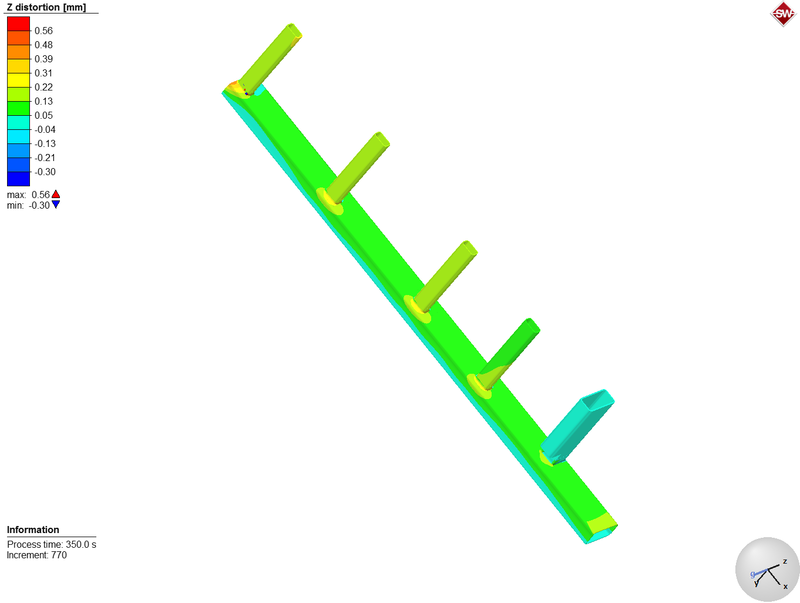 In this representation it is possible to pick several points on the surface of the model and to extract exact result values for picked positions. It is also possible to create cross-sections to visualize result values inside the body. The color legend can be edited in terms of limits, colors and representation and can be used for representation of thermal results as well as distortions, stresses, strains, strength and material state. The legend range can be automatically adjusted to visible components or to components without fillets only. Additionally, it is possible to show positions of minimal and maximal result values in each increment. Furthermore, the position of the heat source or of electrodes in a resistance spot welding process can be shown in each increment. All calculated result values can be used for definition of user-defined results, result values calculated with arithmetical, trigonometrical or logical operators out of already existing results. Simufact Welding also provides a welding monitor, a tool representing the temperature field at cross-sections along the weld line. This helps to evaluate the melt pool geometry and the heat affected zone, useful for example during heat source calibration using metallographic cross-sections. All kinds of visualizations can be exported with the integrated screenshot tool. It is also possible to show results of several processes inside a single project, for instance if the user wants to compare results achieved with different process settings like welding sequences. Shown results values, orientation of the view, clipping planes and time steps can be synchronized between the result views of each process. Resulting fields can also be represented and exported as videos over time, with the possibility to vary the length of the video as well as used codec and resolution. The result values can undergo a coordinate transformation in order to represent the positioning on the measuring table or if it comes to out-of-plane evaluations of distortions. It is also possible to define a cylindrical coordinate system, useful to evaluate the roundness of the final assembly, as well as axial, radial and tangential values on components with rotational symmetry (i.e. shafts). 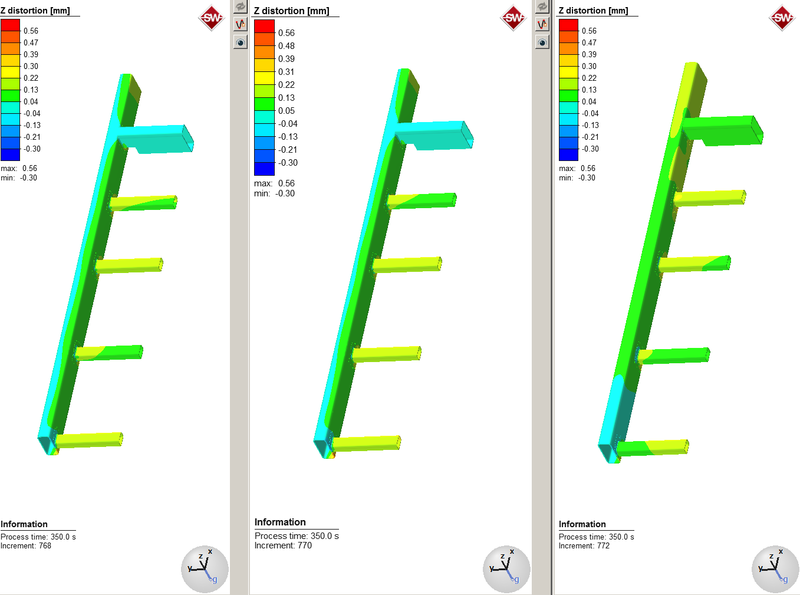 Besides three-dimensional visualization, Simufact Welding also offers the possibility to export results as X-Y-plots over time. 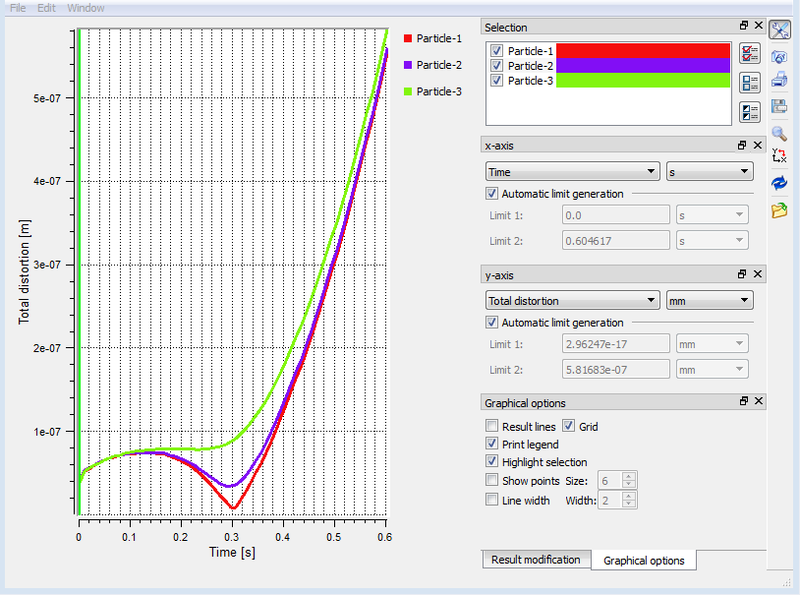 Before or after the simulation the user can define several sets of points of interest in the model, called Particles. Result values present in the particles can be then represented as diagrams and exported into CSV-format for further processing using some 3rd-party software. In a similar way, using time-history-plots (THS) it is possible to represent forces and displacements acting on tools, a result representation helping to optimize fixtures and clamping tools. All result values including component meshes are exportable via UNV-file (universal file format) and can be used in some 3rd party simulation software supporting the format for following process steps.